Nearly two weeks ago, the morning before the Tour de Jalapeno, my dog Queequeg went tearing out the door at 4:15 am after some small animal that’d been lurking in our backyard for weeks. She came back on 3 legs, dragging one behind her. 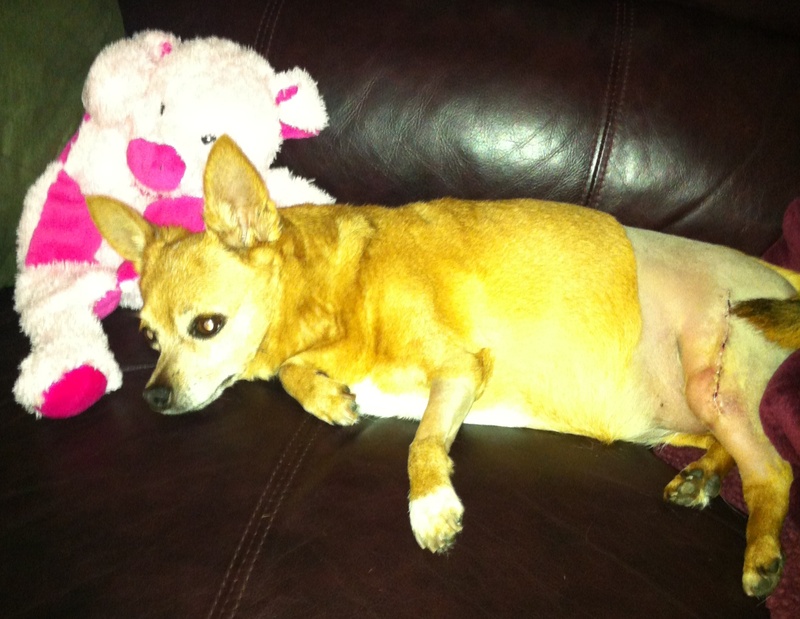 A torn ACL, it turns out, requiring extensive surgery to repair both it and her knee. She spent more than a week laying around and staring at me with sad eyes, her leg swollen and bruised and ugly. She wasn’t at all interested in toys or food or playing with my other dog, Smaug, from whom she is usually inseparable. But then one morning as Smaug and I were leaving the house for a walk, there she was, tottering on 3 legs in front of us, wagging her tail slowly, nudging my hand and sticking her nose in the door crack. She wanted to walk too. I think I know how she felt. Habit and instinct and whatever sense of fun dogs have was kicking in. A morning walk is what we do, what we’ve done her whole life. No sooner had she started to feel even a bit better her first impulse was to be outside and run. A dog after my own heart. Queequeg’s stitches came out yesterday, and the doctor gave her the all-clear. He suggested I take her to the pool for a few days, make her swim, rehab her leg. Looks like we’re going to have to drag ourselves out of bed earlier than usual for a while, sneak to the pool before the neighbors are up and about. Somehow I think they’d frown on a Chihuahua using the neighborhood pool, even on doctor’s orders. I hope Queequeg likes swimming as much as I do. Soon enough, she can walk to her heart’s content. Maybe next week I’ll get her a bike. Before you know it, she’ll be a bona fide tri dog. That picture breaks my heart! Poor little sad girl! Glad to hear she is feeling better. Thanks. She hates swimming, after all. But boy is she walking like crazy! She makes me proud.